An all-star cast will come together to celebrate the life and music of country music icon and Hall of Famer Don Williams in a new tribute album with the proceeds going to a good cause. Gentle Giants: The Songs of Don Williams will be released on May 26th via Slate Creek Records, and feature contributions by Dierks Bentley, Garth Brooks, Brandy Clark, Jason Isbell & Amanda Shires, Alison Krauss, Lady Antebellum, Keb’ Mo’, Pistol Annies, John Prine, Chris and Morgane Stapleton and Trisha Yearwood. 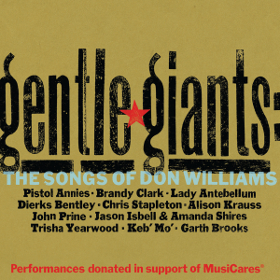 The performances on Gentle Giants: The Songs of Don Williams are all being donated in support of MusiCares, which is the charitable arm of the Grammy Awards that provides a safety net of critical assistance for those in the music field in times of need. 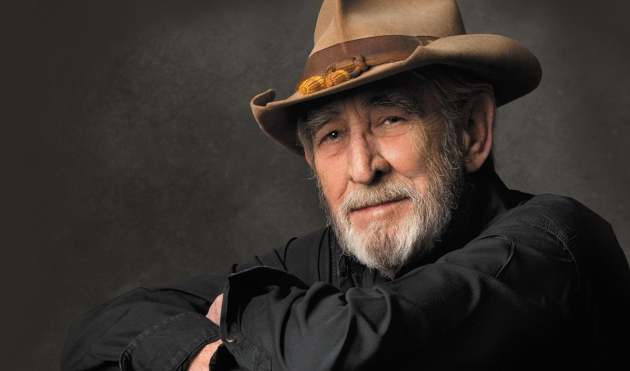 Don Williams had 17 #1 hits over his career and was inducted into the Country Music Hall of Fame in 2010. He officially announced his retirement in March of 2016. That’s a pretty solid line-up, to say the least. I’m looking forward to this. Looking very forward to this, but not nearly enough tracks. So many more Gentle Giant hits that should be covered on this album; the most underrated country music performer in history, in my opinion. Underrated? He had 17 #hits, many more top 10s and he is a CMHOFM. That’s literally the opposite of underrated. In my opinion Jean Shepard is the most underrated country singer ever. Just a beautifully simple song. I sang it to my wife during our wedding ceremony. Today’s generation of “songwriters” could learn a lot from guys like Wayland Holyfield. Most specifically, less is more. I wish Jason or Dierks were doing good ol’ boys like me. I work for a heating and air company in nashville and I replaced the unit at Mr. Fundis’s home. Didn’t know at all who he was until I came inside and saw the records on the wall…. we talked for an hour or more throughout the day about music and he talked about keith whitley and Don Williams. He’s a salt of the earth guy. Gave me brand new copies of “Don’t close your eyes” and “Don Williams’ greatest hits” lps from his personal collection. One of my coolest days at work. Only customer to ever give me records at the end of the day. That is one helluva lineup. 🙂 I’m probably most excited for the Pistol Annies; and I’m glad to see “Lord, I Hope This Day Is Good” will on there. * will BE on there. Does this mean the Pistol Annies are a thing again? Didn’t they have some kind of falling out? I thought I read a while back they were working on a new album. But, I read yesterday Angaleena Presley has a solo album coming out this spring. Miranda is hitting the road promoting TWOTW. And Ashley is pregnant. So, I wouldn’t except anything from the Pistol Annies until 2018. I’ve heard Chris Stapelton’s rendition of Amanda on an old youtube video. He sings the heck out of it. Yes he/they do. Helluva cover and what really made me pay attention to him. My son told me he won the CMA award but I don’t watch awards and don’t listen to much of anything I’m not familiar with. My son(s) know my taste in music so I knew I needed to give him a listen….. I just looked him up on you tube one evening when I was bored. I listened to Amanda and was sold. Miranda covered “Tulsa Time” on her 2015 tour and did a great job with it. Lookin forward to hearin the Pistol Annie’s again. Swap out Garth for Jamey Johnson and it would be the perfect cover album. “Good ole Boys Like Me” is right in Jameys wheelhouse in my opinion. He is actually the first artist I thought of on this song before ever seeing who was contributing. Jamey has covered lay down beside me at his shows and absolutely nails it. He often covers Tulsa Time too. Surprise he isn’t a part of this, especially since Krauss is. Fulfilled a lifelong dream getting to see Don Williams in October 2015,after two dates in the last five years prior to that which were near me had been canceled .He still sang very well but it was obvious his health was failing.Very glad to see we’ve not forgotten him?Ill buy this soon as its out. Does anyone have any idea how Don is doing? Ooooooohh, I love Don Williams. This will undoubtedly be a great album. But like the other commenters above kinda touched on, it’s missing alot. Like you said he had 17 hits and tons of great material. Why only 11 songs? This should definitely be double album. Rake & Rambling Man, My Best Friend, Listen to the Radio, it must be love, love me tonight, love me over again, if Hollywood don’t need you, now that is easily enough material for double album and those are just my favorites. I too wish I could hear isbell sing good Ol boys like me or I’m just a country boy. Not trying to be negative, but this track listing makes me want more. More artists, more songs. Nice to see so many female artists represented on the project. A wonderful line-up of great talent and songs. I agree with the earlier posts that there should be more songs on this collection: how about 16-18 songs? There are many fantastic songs in Don’s catalog. And no matter who sings what songs, no one can top the original versions by Mr. Williams. I look forward to this very cool compilation. “If Hollywood Don’t Need You” is my personal favorite and I’d like to think it wasn’t included because his version can’t be topped. It’s funny because in the Texas/Red Dirt scene there are already two great Don Williams covers that are gonna be hard to top in my opinion. Those being Jason Bolands live version of Tulsa Time and Brandon Rhyder’s Lord I Hope This Day is Good. Literally cannot wait! This is the first release of the year that I am really looking forward to. I understand the concept of a tribute, but I think I’ll stick to listening to the original. Don Williams is a treasure.